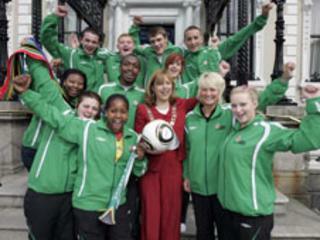 Three teenagers from Belfast are part of a team representing Ireland at a football tournament in South Africa. No it's not the World Cup - Sport Against Racism Ireland (SARI) is one of 32 charities taking part in the Football For Hope Festival. Each team is made of four boys and four girls and the games have no referees - any disagreements are to be resolved through dialogue. They will played in a specially constructed stadium in the heart of Alexandra, a township in Johannesburg. It was the scene of xenophobic attacks in 2008. SARI's first match is against a mixed Israeli/Palestinan team on Sunday. In total, the delegations represent 35 nations, including traditional football powers like Germany, Brazil and Argentina as well as others such as India, Lesotho, Tahiti, Bosnia-Herzegovina, Australia, Zimbabwe and Rwanda. Among them are organisations which use football to address ethnic violence in Israel and the Palestine Territories, environmental pollution in the slums of Kenya, HIV and Aids education in South Africa, landmine education in Cambodia and gang culture in Ecuador. The two-week festival will also include a programme of activities involving the international delegations and their South African hosts. FIFA president Sepp Blatter said: "The Football For Hope Festival will be a unique opportunity for organisations using football as a tool for social development in every part of the world to interact with each other and to showcase their programmes on football's biggest stage." The SARI team was taken by FIFA to the Spain v Paraguay quarter final on Saturday night. Its Belfast players are Jade Stitt and Craig Baillie from the east of the city and Jennifer Hall from the west. The team's trainer, Mandy Waring, is also from east Belfast. The rest of the team is made up of four teenagers from Dublin and one from Monagahan.